Ten years ago, two chambers of commerce and industry (IHK) of the German state of Hessen predicted extraordinary growth of their mostly small and medium-sized member enterprises’ China business. This would mean a growing demand for China specific services from the IHK. These two were the chambers of Frankfurt and of Darmstadt, and they decided to jointly establish a “China Competence Center” (CCC). They celebrated the 10th CCC anniversary on 27 November 2017 at IHK Darmstadt, reviewing quite a success story. Sonja Mueller, general manager of CCC, and the chambers’ department heads of international affairs Martin Proba (Darmstadt) and Dr. Juergen Ratzinger (Frankfurt) confirmed the great acceptance of this service with regional small and medium-sized enterprises, even beyond Hessen. In just one decade, the CCC assisted 770 Chinese enterprises to settle down in the Rhine-Main Area. It received more than 100 Chinese delegations, organized 150 major events, answered 4,400 enquiries and published 40 articles. Beijing correspondent Stephan Scheuer of the German “Handelsblatt” business daily described in his keynote speech some of the latest developments in China. He pointed out that some sectors were given priority and special support in Xi Jinping’s development strategy, opening new opportunities for German companies. “In some other sectors, however, China is already much ahead of Germany and even of Silicon Valley, such as digitalization and online services,” said Scheuer. 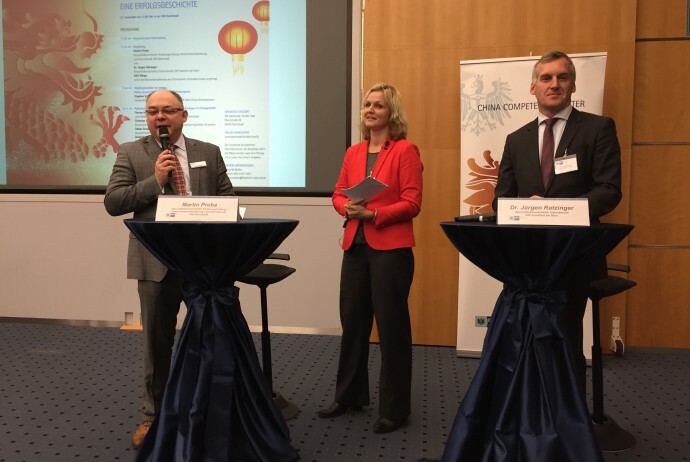 Sonja Mueller presented examples of good cooperation between Hessen and China in a panel discussion with regional business people and sports celebrities. More info and image source: Deutsch-chinesische Allgemeine (in German). On 21 October 2017, organisations and enterprises of vocational education formally established a “Sino-German Alliance on Dual Vocational Education” in Nanjing, capital of Jiangsu province. Different from already existing bilateral VET associations, the new alliance will, according to its Chinese name, focus on the cooperation between enterprises and schools, and thus focus on truly “dual” vocational education. 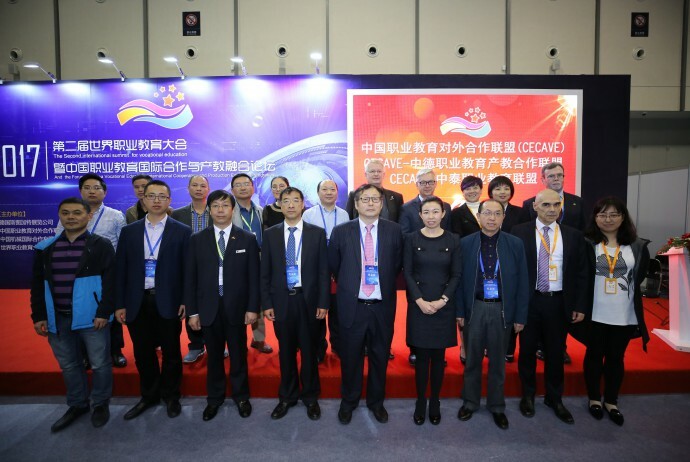 The alliance was founded at the “International Summit for Vocational Education”, which was part of Education Plus 2017, an exhibition organized by Messe Stuttgart Nanjing Ltd. During the constituting session, founding members adopted by-laws and unanimously elected their chairman, Simon Zhao. He is CEO of the National Center for Open & Distance Education in Beijing. The new alliance is a branch organisation of the “China External Cooperative Alliance of Vocational Education” in Beijing. Establish a benchmark of vocational education in China by localizing German curricula into the Chinese system. Explore methods of developing vocational talents that are highly demanded by industry. Research German philosophy of skills transfer in vocational education. Apply the German quality assurance mechanism in China. Set up a Qualification Assessment Center based on German qualification standards. Train teachers by working closely with member enterprises and schools. Develop a significant number of senior managers to apply German learning techniques in Chinese colleges. Reduce the gap between vocational college graduates and industry needs. Provide German employers in China with qualified workers. For more details on the assocation, contact liw@mail.open.com.cn. For more details on the exhibition Education Plus, see our related article. Jiangsu ranks second in GDP among Chinese provinces and takes position 2×2 on the G8x8 chess board. In 2015, the province produced 7,011.6 billion RMB worth of goods and services, contributing 9.7 percent to the total GDP of China. Depending on the exchange rate, this was almost as much as the GDP of Australia. A Women’s Chamber of Commerce has been founded in Mengcheng, a county in Anhui province, on December 16, 2005. Anhui Federation of Industry and Commerce has supported establishing the new local chamber for women entrepreneurs which was registered through the county’s Department of Civil Affairs.